Recap of Vince getting arrested on RAW and then setting himself up as referee for an upcoming title match. New day opens the show. They are excited about New Year’s Day. They don’t make any resolutions because they are perfect. They tell the WWE Universe that they need resolutions instead, and that they need to learn to appreciate greatness. They provide a list of resolutions for the WWE Universe. The Lucha Dragons come out and challenge New Day. New Day laughs because Sin Cara is hurt, but the Dragons aren’t alone. 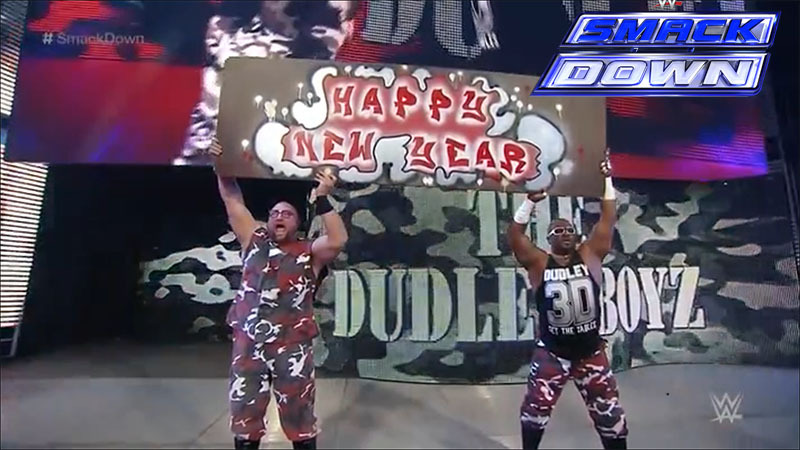 The Dudley Boyz come out with a New Year table. New Day is not pleased. Ryback wishes everyone a Happy New Year and resolves to help the less fortunate and get involved in charities. D-Von starts with Woods and easily controls the match. Bubba tags in and Woods takes a double-team flapjack. Woods gets away and tags in Big E. Big belly-to-belly from Big E to Bubba. Kofi tags in and New Day starts to use teamwork to take over the match. Bubba fights back and takes down all three members of New Day. The Dudleys both hold Kofi and Kalisto performs “What’s Up.” The Dudleys call for tables, but Big E pulls Kalisto off the apron, hurting his arm. New Day rolls him back in and start a Unicorn Stomp. Kalisto is in trouble. Bubba puts Xavier Woods through a New Year’s table. Becky Lynch wishes everyone a happy new year. Booker makes the point that Goldust debuted in 1988, the same year that Tyler Breeze was born. Goldust starts off fast, taking the fight to Breeze. He’s doing well until Breeze catches him with a kick to the head. Breeze attacks Goldust’s arm, but Goldust buys a little time with a spinebuster. A powerslam gives Goldust a 2 count. Breeze continues to use shortcuts and dirty tricks to fight back. He slams Goldust’s arm into the ring post, leverages him into the turnbuckles, then puts both feet on the ropes to take an advantage in a pin attempt. Summer Rae gets on the mic and has an announcement. It’s a shocker. Breeze says he and Summer will go their separate ways. They give us one last gorgeous selfie. Bo Dallas finds Curtis Axel. Go tells Axel that he can turn around his terrible year. Axel says he was never eliminated from the Rumble so when he’s not eliminated this year he’ll be in the match for two years. Bo gives his autograph to a random woman. Ziggler tells Bo he should stop dressing like the New Year’s baby. Harper starts strong, but the Usos use teamwork to stop him. Jimmy gets distracted, allowing Harper to hit a huge Bossman Slam. Strowman tags in and the Wyatts take over. Jimmy tries to fight back, but he’s in trouble. Jimmy kicks Harper and avoids Strowman to make the tag to his brother. Jey is pumped up and hits a Samoan drop and a hip attack on Harper. Strowman tags in, but Jimmy makes the blind tag and kicks him twice. He goes for a third but gets caught in a lifting triangle choke. Tamina has an early advantage over Brie using her power, but Brie uses her speed to tag Alicia. Alicia gets a sunset flip out of the corner and a couple of one-legged dropkicks. Fox goes for a neckbreaker but gets flipped and kicked by Tamina. Tamina has control, but misses Alicia in the corner. Both women tag. Brie delivers Bryan kicks to Naomi and avoids the rear view. Naomi goes for a bulldog but gets thrown to the corner. Brie hits a Bella Buster for the win. The Miz doesn’t need resolutions and wishes no one a happy new year. Ziggler wrestles and gets Dallas down for two quick covers. Dallas gets Ziggler down and does a victory lap. Getting back in the ring, he takes a dropkick and a neckbreaker. Ziggler misses an attack in the corner and goes down. Dallas looks a little angry and hits a series of elbows. Dallas seems like he’s in control, but a quick superkick from Ziggler ends the match. New Day now has resolutions. They resolve to have Kofi become the World Heavyweight Champ. Reigns and Sheamus start. They strike each other pretty evenly until Reigns hits a neckbreaker and sends Sheamus to the floor. Ambrose tags in and dives onto Sheamus on the floor. Sheamus tags out. Owens strikes, but Ambrose quickly fights back and hits a bulldog. Owens rolls out of the ring. Ambrose follows and runs Owens into the announce table and the barricade. Ambrose sets up the table for revenge from RAW. Owens runs him into the apron of the ring. Owens is in control in the ring. He drives Ambrose into the corner and tags Sheamus. Sheamus keeps Ambrose down on the mat. Ambrose fights back but takes a knee to the gut and forearms to the chest. Ambrose avoids White Noise. Owens tags in but takes a clothesline. Reigns is tagged in. Reigns attacks Sheamus with strikes and a Samoan drop. Sheamus gets a schoolboy but takes a Superman punch. Reigns sets up for a spear but Ownes grabs him from the outside and crotches him on the ring post. Owens and Sheamus continue the attack after the match, sending Reigns over the announce table. Owens sets up to powerbomb Ambrose through the table like on RAW, but Reigns hits Owens with a Superman punch. He then spears Sheamus. He and Ambrose celebrate on top of the announce table. Not a bad show. Nothing really mattered as far as storylines go, but I like that every once in a while. It mixes things up and makes the show a little more interesting in certain ways. Like seeing Bo Dallas and Curtis Axel get to have a little comedy but. Stuff like that wouldn’t fit into RAW all the time. Not the most spectacular match, but I really liked how Breeze wrestled. He was as dirty as he could possibly be in the time he was given. He also had a bit of a game plan. He even managed to stop one of Goldust’s signature moves, the uppercut.